To evaluate feasibility of a 3D-isotropic self-gated radial volumetric interpolated breath-hold examination (VIBE) for late-phase MRI of the liver. 70 patients were included and underwent liver MRI at 1.5 T. Depending on the diagnosis, either Gd-EOB-DTPA (35 patients) or gadobutrol (35 patients) were administered. During late (gadobutrol) or hepatocyte-specific phase (Gd-EOB-DTPA), a radial prototype sequence was acquired and reconstructed using (1) self-gating with 40 % acceptance (rVIBE40); (2) with 100 % acceptance of the data (rVIBE100) and compared to Cartesian VIBE (cVIBE). Images were assessed qualitatively (image quality, lesion conspicuity, artefacts; 5-point Likert-scale: 5 = excellent; two independent readers) and quantitatively (coefficient-of-variation (CV); contrast-ratio) in axial and coronal reformations. In eight cases only rVIBE provided diagnostic image quality. Image quality of rVIBE40 was rated significantly superior (p < 0.05) in Gd-EOB-DTPA-enhanced and coronal reformatted examinations as compared to cVIBE. Lesion conspicuity was significantly improved (p < 0.05) in coronal reformatted Gd-EOB-DTPA-enhanced rVIBE40 in comparison to cVIBE. CV was higher in rVIBE40 as compared to rVIBE100/cVIBE (p < 0.01). Gadobutrol-enhanced rVIBE40 and cVIBE showed higher contrast-ratios than rVIBE100 (p < 0.001), whereas no differences were found in Gd-EOB-DTPA-enhanced examinations. Self-gated 3D-isotropic rVIBE provides significantly superior image quality compared to cVIBE, especially in multiplanar reformatted and Gd-EOB-DTPA-enhanced examinations. • Radial VIBE acquisition reduces motion artefacts. • Gd-EOB-DTPA-enhanced scans provide improved image quality. 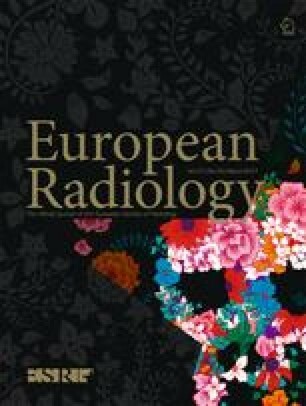 • Non-diagnostic liver MRI examinations may be reduced by radial k-spaces sampling. The scientific guarantor of this publication is Mike Notohamiprodjo. The authors of this manuscript declare relationships with the following companies: Robert Grimm is an employee of Siemens Healthcare and was involved in the development of the self-gating algorithm. The authors state that this work has not received any funding. No complex statistical methods were necessary for this paper. Institutional Review Board approval was obtained. Written informed consent was waived by the Institutional Review Board. Methodology: retrospective, performed at one institution.